Surrounded by Bay Trees(the sacred tree of Apollo, A.K.A. the Daphne), the Monastery at Daphne is a beautiful reminder of the Byzantine empire and their art work. 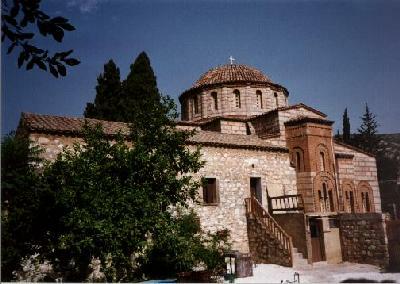 The Monastery was founded in the sixth century in dedication to the Dormition (sp?) of the Virgin. After barbarians pillaged the site, crusaders from France came across the site and took it under their protection. They handed it to the Monks of St. Bernard who rebuilt the Monastery and named it Dalphinet. 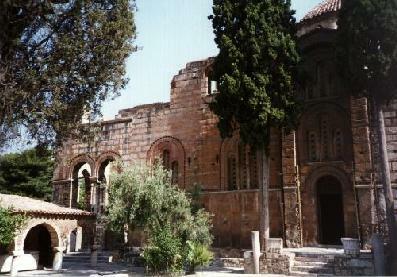 Because of its closeness to Athens, it came a favored burial place for dukes of Athens. Greeceat this time was under control of the French and they did it to imitate the Citeaux, where dukes of Burgundy were buried. 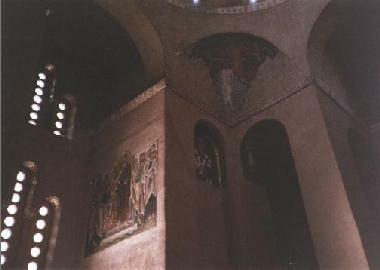 The Monastery, a Byzantine structure, retains much of the artwork, though much is faded. I found the art work as enjoyable than the art work at the Óssios Loukás Monastery in central Greece which is suppose to be one of the most beautiful example of Byzantine artwork left around. 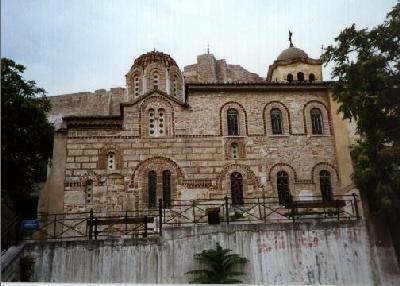 The structure is also a good example of a Byzantine church. If you ever find yourself in Athens, I highly recommend coming out to the monastery. 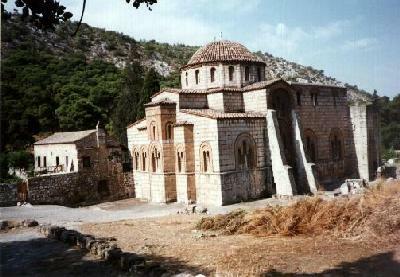 However, if you really want to see Byzantine artwork and architecture, you want to trek to Mystrain the Peloponnese. The site has been of importance much longer than the Monastery has been around. It was originally a temple of Apollo (The god of the Sun) Because it was his temple it was surrounded by Bay (Laurel/Daphne) Trees; Daphne in Greek. These trees are important to Apollo because they reminded him of a nymph he had once fell in love with, Daphne. Daphne wanted nothing to do with any man(or god for that matter) and tried to flee Apollo. However she was no match for the god. In desperation she begged her father, (the river Peneus) to do something. So Peneus turned her into a Bay (Daphne) Tree. This is how Bay trees became a symbol of Apollo. Though no longer used as a monastery, it is being restored for others to enjoy the artwork inside.